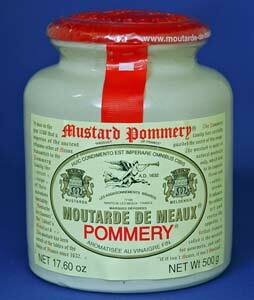 This is the great Pommery Moutarde de Meaux in the 250 g crock. 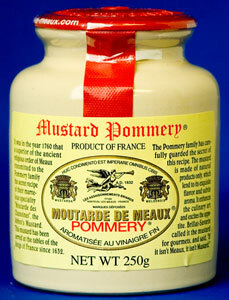 This grainy, earthy French mustard has not changed since it first being made by monks more than 350 years ago. Certainly one of the world's most revered mustards. Order the larger (500 gr) crock for just a few dollars more. See below. This is the great grainy French mustard that goes back more than 300 years. Perfectly balanced with a rich nutty flavor. It comes in this large (17.5 oz) stone crock, the way it was made centuries ago. Its elegance derives from its natural simplicity: water, mustard seed, vinegar, mustard bran, and spices. Nothing artificial. It is a favorite of chefs around the world. 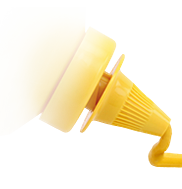 A GORGEOUS MUSTARD! Ingredients: Water, Vinegar, Mustard Seeds, Salt, Spices. Limit 3 per mustard lover.